Photoscape is a well known free photo editor and picture manager. You can use Photoscape to fix and enhance photos. Photoscape has mang useful features: Image Viewer, Image Editor, Batch Editor, Page, Combine, Animated GIF Creator, Print, Splitter, Screen Capture, Color Picker, Raw Converter, Rename, Paper Print, etc. Note: Run PhotoScapePortable.exe to launch PhotoScape Portable. 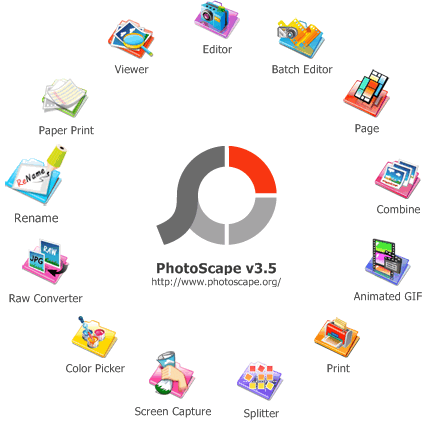 Photoscape Portable was updated to version 3.6.5 on 2013/7/7. This entry was posted in Photo & Graphic and tagged image converter, image editor, image renamer, image viewer, photo manager, Photoscape, photoscape portable, picture manager, raw converter. Bookmark the permalink.